I made my own Healthy Cranberry Sauce the other day. It came out fantastic! So naturally, I have to find some delicious uses for it other than as a side for Thanksgiving. First, I came up with my Cranberry Thumbprint Cookies and they were a hit. I also love peanut butter anything, so I decided to try some peanut butter and jelly pancakes! These are not only good, but they are kid friendly too. What kid doesn’t like peanut butter and jelly? Plus, it is a fun recipe that you and your kids will enjoy making together. My daughter, Meadow, loves helping in the kitchen. In a small bowl combine the wet. You may need to heat up the peanut butter if you keep it in the fridge like I do. Add wet to dry and mix until smooth. Heat a medium or large skillet pan and scoop out 1/4 cup servings of batter. Flip when you see it start to bubble. Remove, add jam and eat. These turned out AHMAZING!!! We love all things PB&J! 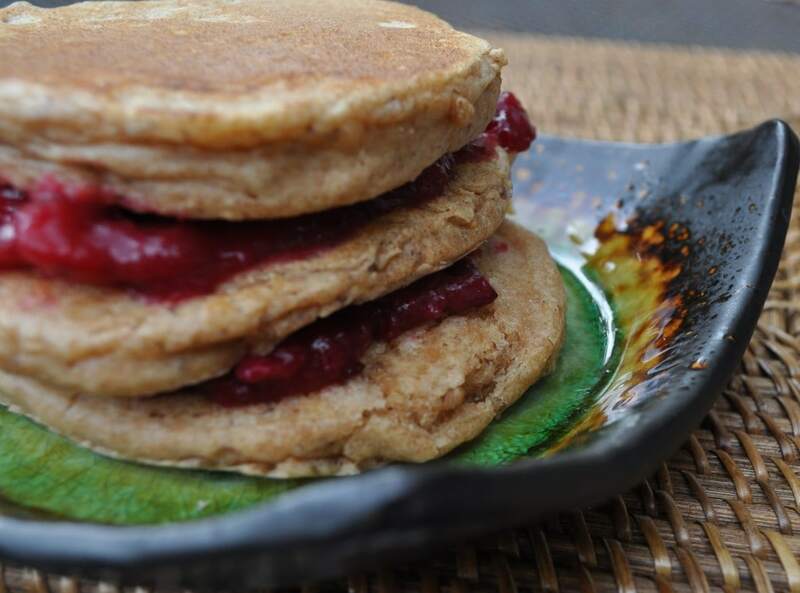 I have made quite a few vegan pancake recipes and I must say these top the charts! You truly have talent and these pancakes show your skill and creativity! I look forward to trying more of your recipes! My 4 kiddos r loving ur pancake recipe. I did do plain though an today added blueberry. Also used honey instead of syrup. Still wonderful. Thank u! These are fantastic. I made peanut butter pancakes with some chocolate chips & sliced bananas as a topping. Although the PB&J would be great for kids. When I make your recipes I have to double the amount because people just want more! I can eat these every weekend! yum. These are really good! I made them for breakfast and my daughter loved them! :) thanks so much! It's been a while since I made these, but I think I got 5? I hope you enjoy the recipe! I got 14 smallish ones but they are really puffy, so the seem bigger. Just made these for dinner for my kids! Daddy is gone & we're having pancakes!!! ;) They were very good. I did find that they will burn fast if you don't watch em on the 2nd side. Glad you liked them! I have been meaning to remake this recipe. It's been a while since we have had it. Yay! I'm so glad you enjoyed them! I do not have spelt flour on hand, would there be another kind that would make a good substitute? I do have oat, quinoa, white whole wheat and coconut, will any of these work in your opinion? Thanks in advance! White whole wheat will work. I also think oat flour might work. Just made these and they were so good! Made them with white whole wheat flour, almond butter, and raspberry chia jam. :) Thanks for the awesome recipes!! You're welcome Wendy! So glad you liked them! Hello, do you think I could make the batter the night before and keep it in the fridge to make the pancakes in the morning? I have never tried, but you might be able to do that. I usually mix the dry ingredients the night before, and then add the wet in the morning.